Amazon.com shoppers can support the CSP Foundation via the eScrip program simply by shopping online. Stop by eScrip, create an account and shop. The CSP Foundation then automatically receives 1.2% of the cost of your qualifying purchases. The eScrip program also provides more direct financial support for the CSP Foundation. By registering your credit cards through eScrip, the CSP Foundation can earn up to 2.5% of the cost of your purchases made on those cards. These donations come from the merchants; you pay nothing. The contributions will assist with the CSPF Mini-Grant program. For more information on this program click here or visit escrip.com. Don’t forget to check the box next to CA School Psychology Foundation. 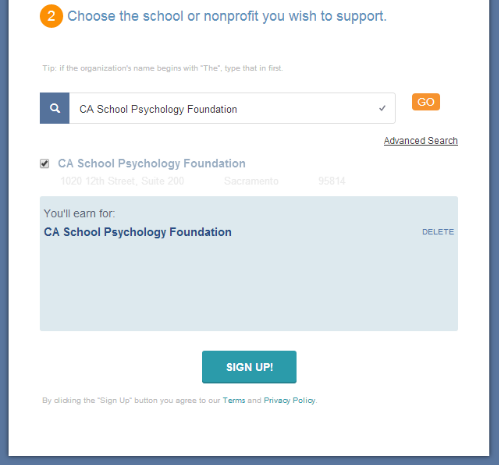 Once you’ve selected the CA School Psychology Foundation, click sign up and you’re all set to support the CSP Foundation!